An adult has 32 permanent teeth. The incisors and canine teeth tear and cut food, and premolars and molars are used to grind and crush. The four back teeth are called the wisdom teeth (or third molars). Maintaining a proper diet - missing or badly decayed teeth often cause young children to reject foods that are difficult to chew. 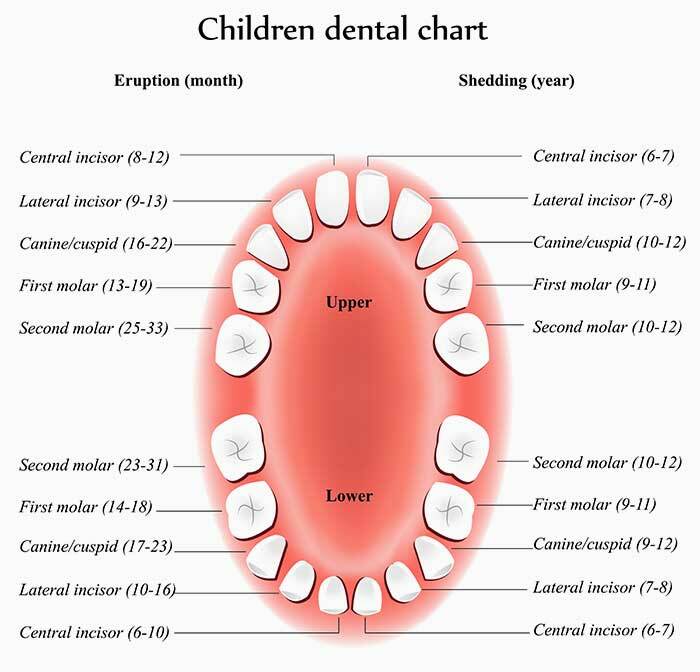 Maintaining space for permanent teeth - prematurely lost primary teeth have a large effect on the way permanent teeth come in Decay and infection in baby teeth can cause dark spots on the permanent tooth developing beneath it. The three main parts of a tooth are the crown, neck and root. The crown is the portion of the tooth visible in the mouth. The crown is covered with enamel, which is highly calcified bone; it serves as the protective layer of the tooth. Enamel is made up of millions of tiny rods which form the framework of the tooth. Enamel is thickest near the biting surface of the tooth and thinnest near the gumline. The color of enamel varies from yellow to white depending on its translucency. The more translucent it is, the more the yellowish layer of dentin underneath shows through. The enamel portion of the tooth has no feeling. Even though it is extremely hard, it can wear away due to attrition (wear) and may fracture due to stress. The layer underneath the enamel is the hard substance known as dentin. It forms the bulk of the crown and the roots. 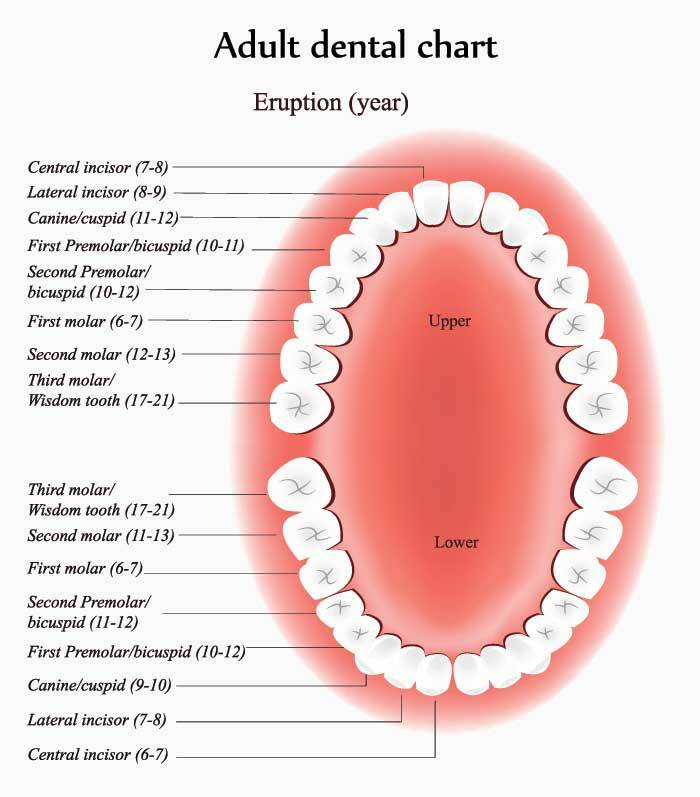 Dentin is softer than enamel and carries sensations, such as temperature and pain, to the pulp. The pulp comprises the innermost portion and is the only soft tissue of the tooth. It supplies nutrients to the tooth and its nerve endings transmit sensations such as pain and temperature. Cementum forms a very thin layer over the roots of the tooth and is similar to bone. It's yellowish in color and carries sensations to the pulp. The gums (or gingiva) fit around the teeth, and the roots of the teeth fit into sockets in the jawbone. Lining the sockets is a tissue called periodontium. Bonealveolar bone which forms the tooth socket and provides the tooth with support. Cementumthin layer of bone-like tissue covering the root of the tooth. Dentimthe hard yellow tissue underlying the enamel and cementum, making up the bulk of the tooth. Enamelthe hard, white outer layer of the tooth. Nervesrelay signals such as pain to and from your brain. 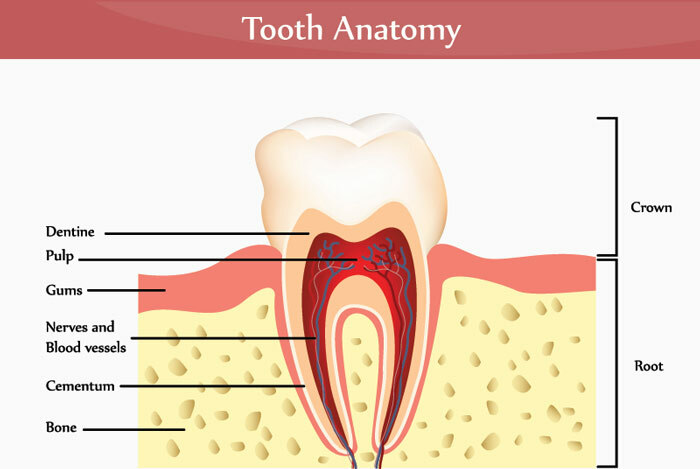 Periodontiumthe connective tissue which surrounds the tooth and connects it to bone. Pulplocated in the center of the tooth, it contains the blood vessels and nerves. Root canalcanal in the root of the tooth where the nerves and blood vessels pass.